The Chindits have a special place in British military folklore . There were two operations , deep penetration raids designed to disrupt the Japanese lines of communication and thus weaken their offensive power : at the time of the first operation, they were being held on the frontier of India in Assam , but there was no prospect of a counter-offensive. 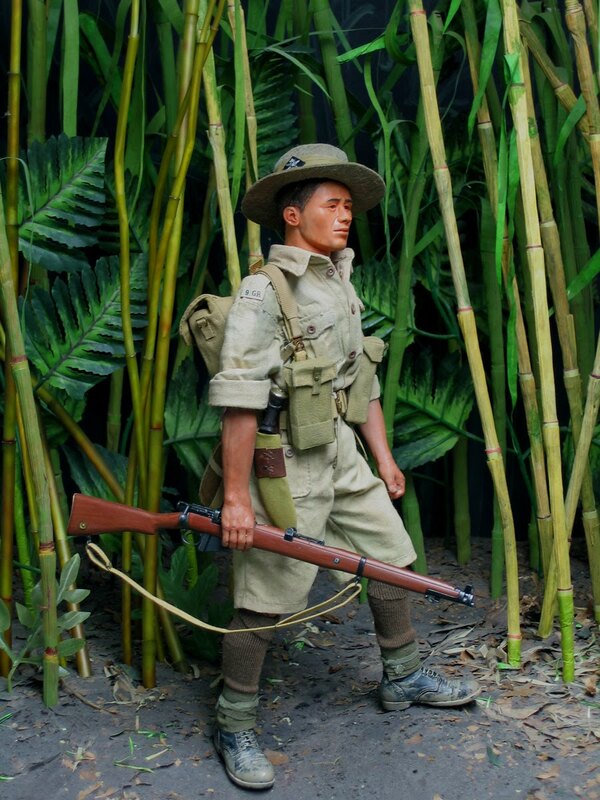 The first operation, starting in February 1943 , using a four battalion force of British , Gurkhas and Burmese , who were not specially selected , but given jungle training beforehand . The results were mixed : a huge Japanese supply dump was captured and destroyed, but gradual encirclement compelled the force to disperse and attempt to regain Allied Lines in small groups : a third of the men never returned . Despite this , lessons had been learned , and Wingate , who had the ear of Churchill , got the necessary support to try again . The second operation , from February-August 1944 , was on a much larger scale , with six Brigades of British , Gurkhas and Nigerians , supported by a well-planned air supply back-up . Again , the troops were trained , but in no sense were they hand-picked “ Special Forces “ . It was less of a failure , but whether it can really be regarded altogether as a success is debatable .The Japanese were heavily engaged by drawing them onto fortified positions established around airstrips , and mostly beaten off with heavy losses. The Chindits’ casualties were mostly from disease until the end of the operation , when part of the force came under the command of the U.S General Stilwell and used to attack the Japanese position at Mogaung : ninety percent of the battle casualties were in this operation . Most of those surviving both expeditions were unfit for further service , because of exhaustion and the diseases contracted during the campaigns. This figure uses some commercial items, such as the boots , but is mostly scratchbuilt. The head tries to convey some of the physical strain involved: almost all the men were sick most of the time. He carries a modified Large Pack , with extra pouches sewn on the sides. Everything necessary for survival had to carried , and although airdrops and mules were involved, the personal load was huge. He wears an Indian flannel shirt and a pair of JG trousers , and a slouch hat which is starting to fall apart . The Bren LMG is the Mk.III, the late war economy version. 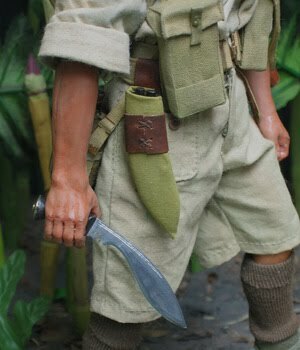 He has a kuhkri , a water chagal on the back of the Large Pack , which has extra pouches sewn to the sidesand a blanket on top , and is just opening his rice bag. 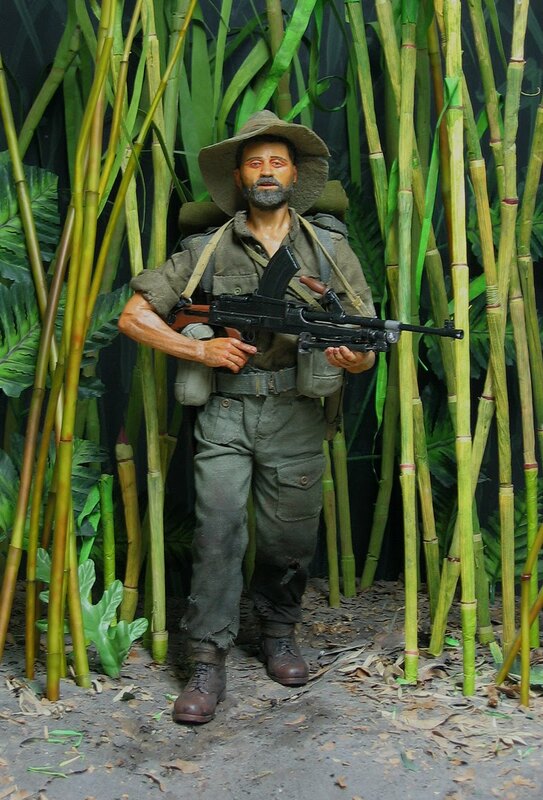 One of the Forgotten Army fighting the Japanese in Burma, he represents a private of the 1st Batt. Devonshire regiment, typical of the troops involved in the defence of Imphal in March and April 1944. The Devons were in 80 Brigade of the 20th Indian Division, and both defended and attacked several vital hilltop positions, notably Nippon Hill on the 11th of April, in a series of desperately hard-fought platoon sized operations. 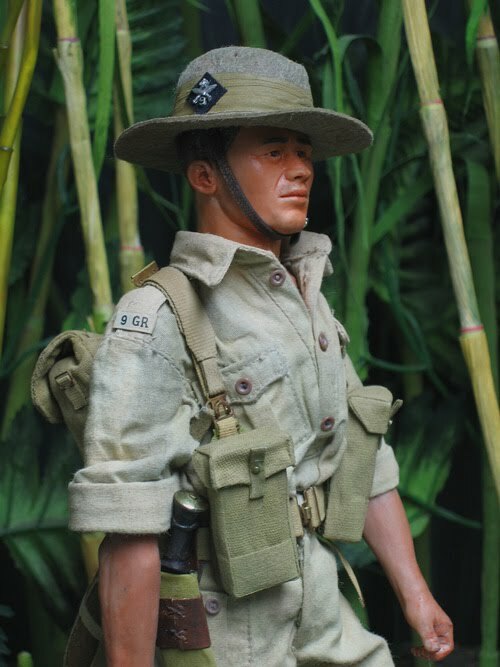 After a disastrous start , the campaign in Burma came to a crisis in the spring of 1944 , by which time the Empire troops facing the Japanese were properly equipped and trained for the job. Commanded by the admirable Bill Slim , they destroyed the Japanese offensive at Imphal , and went on to drive them out of Burma completely. 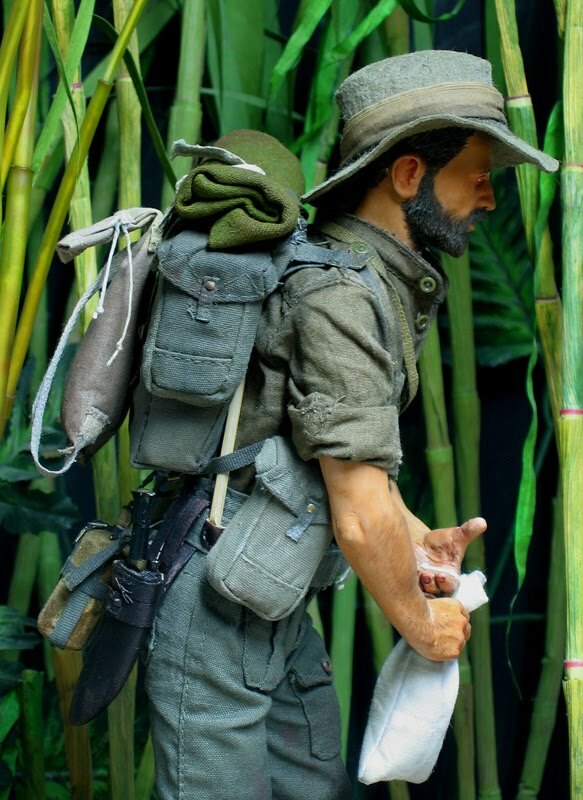 He wears an Indian-made Jungle Green uniform , the usual webbing also dyed green , and a slouch hat . 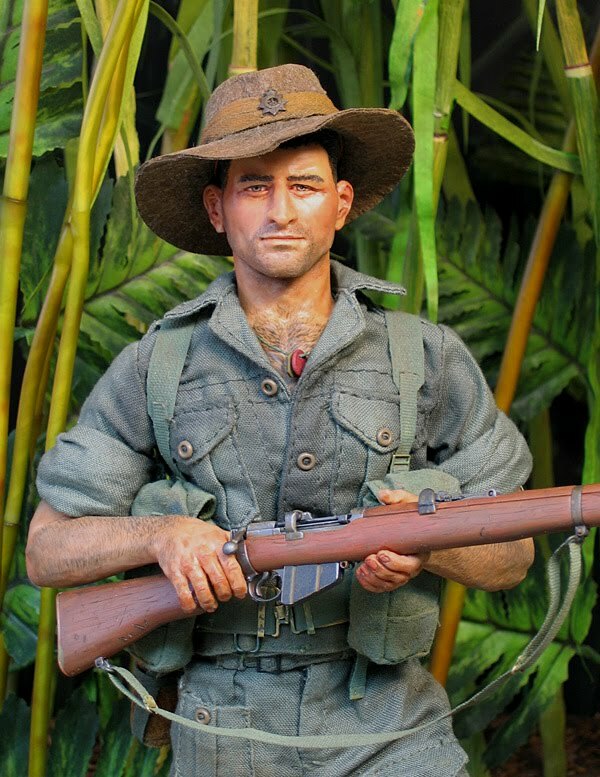 The hats are often rightly associated with Australian troops , but they were worn by most British and Commonwealth troops as well , though they quickly rotted in the damp conditions. In combat helmets were largely worn instead. From the rear ,you can see the waterproof sheet , his oval messtin carried in a webbing waterbottle carrier, and a machete. 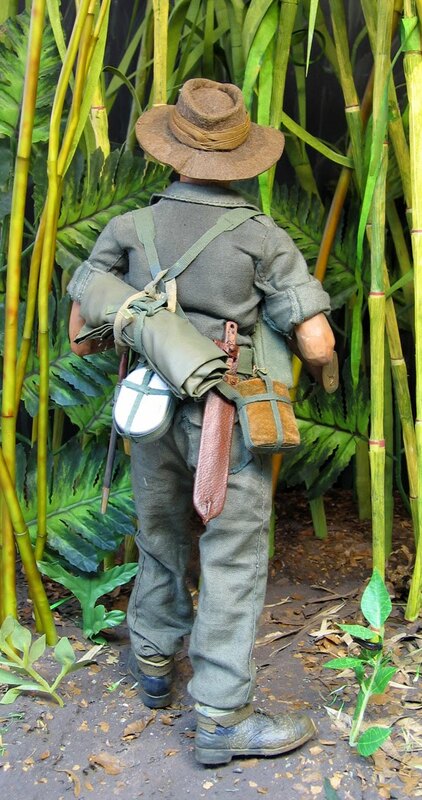 The uniform is from BBI , retailored into the Indian Jungle-Green battledress. All the webbing is scratchbuilt. The slouch hat is made from felt blocked like the original, in this case with the "pork pie " shaped top favoured by many English regiments. I was lucky to find a quantity of fake bamboo at my local garden centre to construct the background for these two . Not strictly a Tommy , but an honorary one at least. The Gurkhas have a special place in the affections of the British, having enlisted in Britain's armies since the 1830s. Like many inhabitants of mountain regions ( the Scots come to mind ) the Nepalese have long sent their young men to serve as soldiers , as a way of finding income in an impoverished land. The service of the Gurkha Regiments is long and extraordinary , and still ongoing : we have some stationed in Fulford Barracks here in York as I write. Tough, enduring and brave beyond measure , they have always won the affection of the British troops who they served with. Despite that they have often suffered badly once discharged, though that seems recently to have been put right. In 1941 , they suffered all the indignities of the crushing defeat in Burma, where the Indian and British troops were outmanouvered at every turn by the Japanese , and more or less fell apart despite heroic behaviour by many. The troops were not trained and equipped for modern war , and badly led . They learnt the lesson, and by 1944 turned the tables. 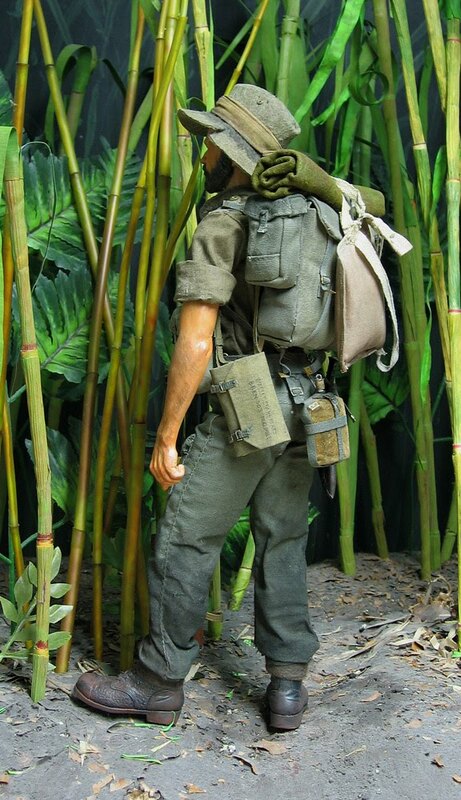 The kit in 1941 was hardly suitable : developed for use in the arid environment of the North-West frontier , it was very conspicuous in the humid green jungle , and rotted quickly. This chap , from the 9th Gurkha Rifles , has just debussed after a long journey , and still retains some smartness. SMLE MkIII, still with the volley sights, utterly useless in a jungle environment. The Gurkha hat is characteristic : they are made from two sewn together , to keep them stiff , though that wouldn't last long. I've made this in felt , blocked like the original , with a silk pagri , which is the only fabric thin enough to make the multiple layers. He has the capbadge of the 9GR on a rifle-green flash on the pagri, and the slip-on shoulder titles used at this period. 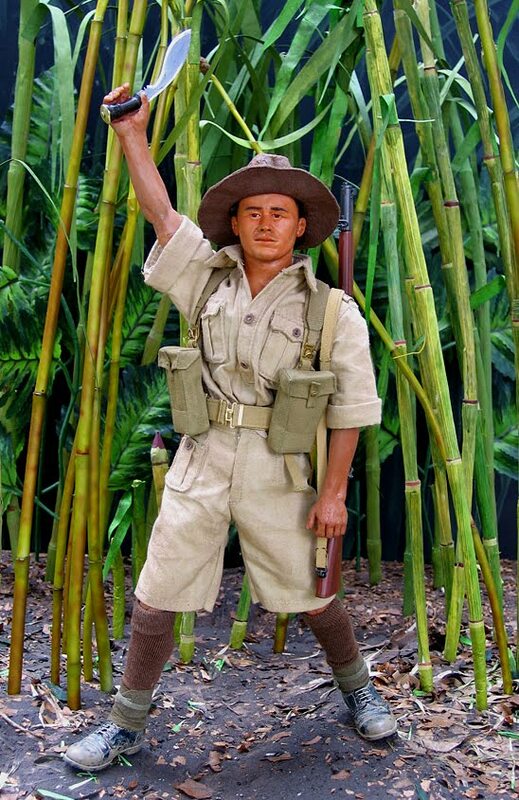 This oufit would be quickly replaced by Jungle Green , long trousers to keep the bugs out , and a proper distribution of short range automatic weapons, but in 1941 it had to do.